All Families of Love one killed by Gun Violence, Please bring an 8×10 photo and Love one favorite color balloon to be release. 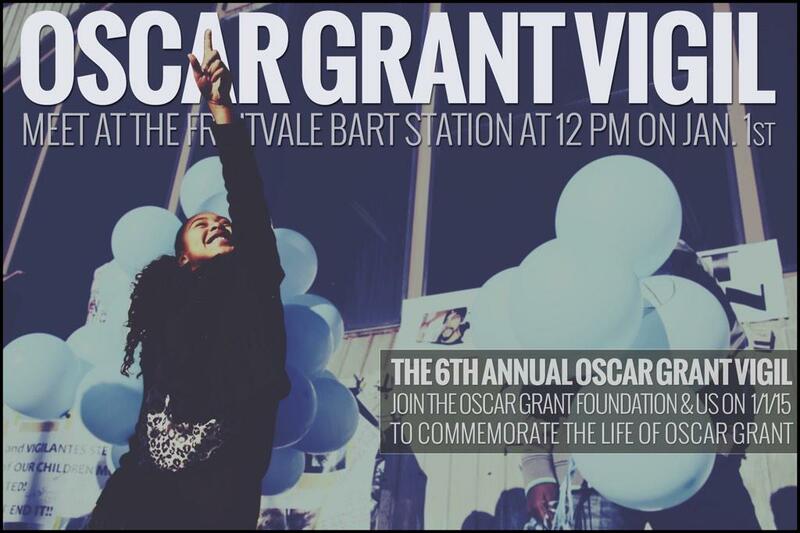 Come meet us at the Grant Station for the 5th annual vigil/celebration for Oscar Grant to be held on New Year’s Day at the Grant Station (Fruitvale BART Station). Join the Oscar Grant family on this Day of Remembrance! Sellassie Blackwell Lyrical, Positive Hip Hop. artist representing the Bay Area will be doing a tribute to Oscar Grant. Much Love from Tatiana and family of Oscar Grant, Hope to see you at the vigil!! “We Are All Still Oscar Grant”. There will be poetry, music, spoken word, candle lighting, Balloon releasing and speak out. “Every tragedy represents an opportunity to move the agenda for justice forward.” We cannot forget and will not forget what happen on January 1, 2009 at 2:11 am. Join us in remembering and celebrating our martyr comrade brother, Oscar Grant. His life was taken to remind us that We Are All Oscar Grant. It was the COMMUNITY that led to the resignation of Alameda County District Attorney Tom Orloff. It was the COMMUNITY that led to the resignation of Bart Chief of Police, Chief Gee. It was the COMMUNITY that led to the resignation of Bart General Manager, Dorothy Dugger. It was the COMMUNITY that led to the resignation of police officer Johannes Mehserle. It was the COMMUNITY that led to the Department of Justice to open a investigation of Civil Rights violation against the Bart Police. It was the COMMUNITY that led the demonstration Downtown Oakland, making it known, “No Justice, No Peace”. It was the COMMUNITY that joined with the ILWU Local 10 to shutdown l the ports in Northern California. It was the COMMUNITY that helped usher in the US 9th Circuit Court of Appeals establishing that using stun guns without an imminent threat of harm is unreasonable. The COMMUNITY have made HISTORY, not VICTORY for the first time in 458 years of California History a officer was charged, arrested, convicted and sentenced to prison for killing a unarmed Black Man in the line of duty. Victory is when we have DESTROYED a racist criminal justice system and replaced with a true Freedom, Justice & Equality for ALL people! Please come to Wiley Manuel Dept 112 at 2pm on Friday (tmrw!) to do court support for comrades, TJ and DT,arrested at march New Years Eve. Folks have marched hundreds of miles all over the East Bay from East Oakland to West Oakland and out past North Oakland. Folks feet gotta be aching by now! Folks gotta be gettin tired of all the kettling! so let’s do a night ride and show some love for all our people’s, let’s show how deep the solidarity runs between our communities. How about creating a critical mass bike ride for #BlackLivesMatter for #NativeLivesMatter! We’ll be riding around Oakland! Cause these are our streets!! this is open to all folks. bring the music, ya feel me! 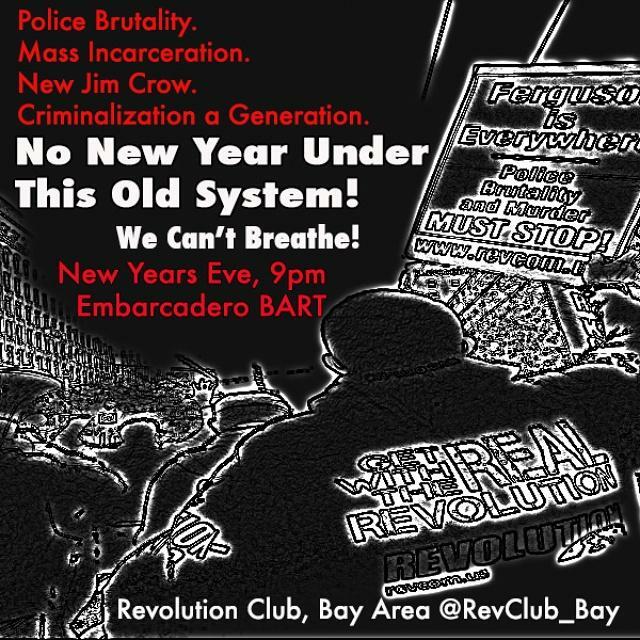 Fixies, commuters, scrapers, peeps with kidseats, roadies, bmxers…if it’s got wheels then you need to show up n show your luv for #MikeBrown #EricGarner #AlexNieto #AndyLopez #OscarGrant & all the countless folks that have lost their lives to police violence. Some of us will get together this Saturday at noon to help plan for the garden. I would like to invite people from Transition, Berkeley and Albany and the farmers market master gardeners and see if anyone shows up and get more advise. Members of First They Came for the Homeless and Berkeley Post Office Defenders are asking people to participate in the creation of a community garden on the west side of the Berkeley Post Office. Please come to a planning meeting on Saturday January 3rd at noon. Honey bees, hummingbird flowers, tiered and vertical gardening, heirloom seeds, organic non GMOs, and medicinal plants are all part of the chat. First They Came for the Homeless members have been at the post office at 2000 Allston Way for over 3 months and we want to expand our use of the space with new ecological planting, growing, weeding and harvesting possibilities . This will help to maintain ongoing protection of the Berkeley Post Office and post offices all over the country from sale and privatization and also will support our community connection with the earth. Many community organizations and individuals have been have been working collaboratively participating in actions to keep this beautiful and historic resource as a post office and for public use. Right now we have had some success as there is no identified buyer and we are waiting to see what will happen with the city lawsuit against the United States Postal Service and how things will develop with the zoning overlay passed by the Berkeley City Council in 2014 to keep it zoned for public use. We want the unheard voices to be present so we can begin to rebuild and protect our communities. This event is to bring together disengaged youth and community members from Hunterspoint, Potrero Hill, Sunnydale, Mission, Fillmore, Tenderloin, and Lakeview who are not currently active in this movement happening across the nation. Because you matter! We matter! Our hoods matter! San Francisco has the fastest out migration of Black people since post-Katrina New Orleans. I feel that it is time that we show the city we are still here, we are young, we are strong, we will fight our whole lives long. This symposium will bring together experts, practitioners, members of community development organizations, local high school and college BSU ambassadors, and youth leaders to create innovative solutions to the racist issues that directly impact youth and their communities. A list of demands to stop police brutality, change current policy and practices as it pertains to law enforcement, and reinvest in Black and Brown communities will be presented to the community at this symposium. The symposium will develop a series of key calls to action and plans for major demonstration utilizing social capital and existing community resources as mechanisms for youth development worldwide. The active engagement and development of leadership skills among disenfranchised youth in marginalized neighborhoods of San Francisco is essential to national security, stability, capacity building, and increased quality of life worldwide. This symposium will bring together community organizers from around the Bay Area, along with practitioners and members of community development organizations, subject-matter experts, and youth leaders to showcase and exchange their experiences and best practices in this area. Please watch this poignant film “Take This Hammer” if you haven’t already of Bayview Hunters Point in 1964 with James Baldwin…everything in this video is still relevant today. Gear up to get MARISSA ALEXANDER out of jail! Free Marissa NOW East Bay is holding an exciting fundraising event to fund our cross-country caravan to spread the word about Marissa. We will have a potluck, music, spoken word, theater, and testimonials from the womyn who are going on the caravan! Come out, support, and REPRESENT the Bay! Marissa, a Black woman who defended herself from abuse & threatened death, by firing a warning shot into the ceiling – injuring NO ONE – is still being persecuted, is back in jail plus she has a new hearing coming up Jan 27th! We are planning a cross-country caravan to arrive in Jacksonville by Jan 27th: Make the freedom of Marissa a national STAND UP, FIGHT BACK cause. Please bring an organic dish to share, if possible. And don’t forget your own plate, utensils, cup. We go green!!! And feel free to bring musical instruments, written words to share, and a lot of money!!! Or just bring yourself! Pack the courts! Come out to Department 9 to support James as he begins his fight against serious charges from Black Friday in San Francisco. CHECK THE FACEBOOK EVENT FOR ANY LAST MINUTE CANCELLATION, POSTPONEMENT OR TIME CHANGE. Come support the Ferguson 3 facing serious charges and going forward to trial. Check the Antirepression website and facebook for last minute updates. Court dates and times change frequently! On Monday, January 5th, Ms. Schaff will be inaugurated as Oakland’s mayor. We will convene outside the Paramount Theater as a silent wall along the sidewalk from BART to the entrance of the theater so that every guest of the Mayoral Inauguration knows that Oakland expects the new Mayor to have a zero tolerance policy when it comes to police terror in Oakland. We ask attendees to join this SILENT protest, wear all black, join the line on the edge of the sidewalk and wear or hold your choice of signage (we’ll be posting some examples for you to print on this event). We will not shout, chant or do anything that makes this an arrestable action. This action is meant to unify Oakland residents (current and those that have been displaced) in a powerful message of solidarity that says to the new mayor: IT ENDS TODAY. The Anti Police-Terrorism is a project of the ONYX Organizing Committee in collaboration with individuals and organizations such as The Community Ready Corps, the Alan Blueford Center for Justice, Healthy Hoodz and the Black Power Network. Information, discussion & community! Monday Night Forum! !Occupy Forum is an opportunity for open and respectful dialogueon all sides of these critically important issues! The culminating event of the week was a dramatic reading of various documents relating to torture by activists from around the world. We will show the video of this important and painful event, called “Reckoning with Torture” followed by up-dates on recent events by Susan Harman. As you know, in late December the Senate Intelligence Committee released a highly-redacted executive summary of its long-awaited 6,000-page torture report. We all need to become informed about what our “leaders” have done and are doing in our name, so we can hold them accountable. Susan belongs Code Pink and has been actively opposing torture for at least a decade. She produced the “Reckoning” event. She also works with Strike Debt Bay Area and Commonomics USA to start public banks, postal banks, and workers’ coops. Q&A and Announcements to follow. Bring the Bay to Department 701 at 9am! Let’s pack the courts to support Marsha, who was arrested doing jail support at Santa Rita. Use this event page to coordinate rides with one another to the Dublin Courthouse. There is also a call for folks to step up and do childcare outside during the appearance. Support the support workers! Check the event page before going as court times and dates change! Always check the AntiRepression Facebook and Website for last minute changes! Fundraiser Online for Eric Garcia @ Online. On New Year’s Eve, our comrade and friend Eric Garcia was brutally and arbitrarily arrested by police and held on false charges. This campaign seeks to reimburse Eric’s bond cosigner for bailing him out of jail. A more detailed description of the incident can be found below. Eric and his friends attended an NYE noise demo in downtown Oakland, which they left after the demonstration was attacked by the police. Eric was standing with his friends on the sidewalk outside Rudy’s Can’t Fail Cafe on Telegraph Avenue, a full two blocks from the remaining marchers, among an assortment of cafe patrons and nighttime revelers, when police officers parked on Telegraph jumped out of their vehicles and charged at the small sidewalk gathering. The police snatched Eric from the crowd and violently arrested him, amid shouts of protest against police brutality. Fortunately, multiple people immediately began cop watching, recording the arrest on their phones, but this didn’t stop the police from hauling Eric off to the station and jailing him on completely unfounded felony charges. Eric’s bail was set at $35,000. Since it was New Year’s Eve, the following day was a holiday, and following the holiday was the start of the weekend, Eric would have been held in jail for 5 nights until his arraignment on Monday if he hadn’t been bailed out, since court does not proceed on weekends and holidays. At his arraignment, given that there was a complete lack of justification for the arrest, no charges have been filed against Eric. The situation he was put in, through no wrongdoing on his part, amounts to state-sanctioned kidnapping and ransom. Please give what you can to help Eric and his partner raise the amount of the bond payment that was exacted from them. These are very trying financial times for them both. If you care about women, children and the planet, come see this revealing and inspiring film. Free goodies available after the screening. 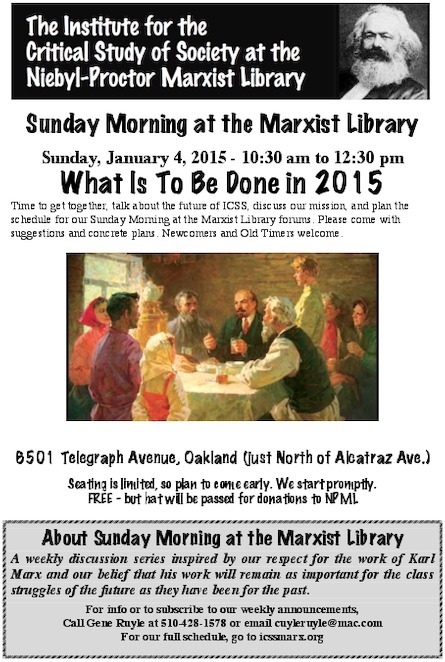 This event is not sponsored by, provided by, or affiliated with the Berkeley Public Library. If you have been protesting, know people who have or just want to know your rights, you should definitely join us. There will be civil rights attorneys from John Burris’ law firm who will be giving a presentation and fielding questions mostly about protesting and knowing your rights pertaining to it, as well as knowing what police can and can’t do, legally. They have also agreed to stay in contact with protesters for any ongoing situations that may arise. There will also be women from Free Marissa Alexander Now east bay who will be discussing our upcoming caravan through the South to Florida and ways you can help support us! You are welcome to come and bring guests! All welcome! On January 8th, the city of San Leandro will have a public meeting. There will be a presentation displaying the “tank” (armored personel carrier – a Lenco Bearcat) at 5:00 pm. The City Council meeting runs from 6:00pm to whenever. Military equipment in urban and suburban police departments have introduced a wide range of problems and concerns including crackdowns on legal protest activities, increased profiling, and police attacks on unarmed black men and women.The armored vehicle has “steel armor plate certified to defeat multi-hit attacks from 7.62 AP / .50 Cal BMG, while ceilings and floors provide enhanced blast and fragmentation protection.” according to the company web site. It also features “a roof hatch with a gunner’s stand” and “gun ports.” There is also a military version of the vehicle, but the agenda item doesn’t indicate which version San Leandro is getting. Come to the meeting to say that small suburban towns like San Leandro don’t need armored personnel carriers and serving and protecting the community is different than terrorizing the community with war machines. There is a state-sponsored war on Black lives in the United States and people across the country are demanding that it comes to an end. As long as it remains business as usual to gun down Black women, men and children in the streets of this country, there will be no business as usual anywhere or for anyone. Shut. It. Down. Oakland’s Anti Police-Terrorism Project is calling a bay area wide spokescouncil to plan and coordinate actions for the upcoming Martin Luther King Day weekend (1/16-1/19). Let’s carry forward and amplify the struggle, together! PLEASE SAVE THE FOLLOWING DATES for upcoming meetings in your calendar. Before your first meeting, please make sure to attend an orientation! A spokescouncil is a collective framework for direct action mobilizations, where large masses of people organize themselves into smaller teams called “affinity groups”. Affinity groups plan their actions independently with the intention of advancing the larger goal of the spokescouncil. Affinity groups are represented by at least one person (“a spoke”) at the meetings, where they are able to share resources and coordinate their actions with other groups. We propose the spokescouncil as a solution to many of the shortcomings of unstructured mass assemblies. We intend to provide a highly structured organizing space with clear tactical and messaging guidelines, that empowers participants to organize independently and in parallel. We intend to inspire a multitude of diverse actions and awaken the massive potential we have as a community engaging in direct action.